Searching for cheap Mumbai flights? Look no further! Rehlat offers amazing discounts on your Mumbai flight bookings and makes you to save your hard-earned bucks. The financial capital of India, Mumbai has carved a specific place for itself on the map of the world and also known as the 'City which Never Sleeps'. Get best deals on Mumbai flight bookings and travel at the lowest price possible. Mumbai is the financial capital of India and it is located on the western coast of the country. It is blessed with innumerable tourist attractions, sightseeing’s, stunning beaches, beautiful parks and world class hotels. The historical city welcomes more than 5 million visitors every year from around the world which makes it one of the most crowded cities in the country. The must visit places are Gateway of India, Nariman Point, Flora Fountain, Banganga and Malabar Hill. Mumbai is a dream destination for shopping lovers that has a range of opportunities for visitors from luxury shopping malls to department stores and small fashionable stores to snazzy boutiques. The beautiful coastal city isn't only famous for the international fashion brands, but also popular for local brands and labels. You can find some of the excellent shopping places in Mumbai like New Marine Lines, Ghatkopar West, Kurla West, Kalbadevi and Andheri West. 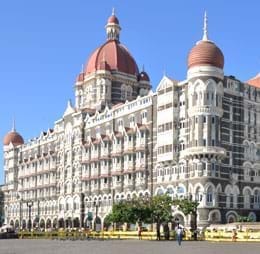 Mumbai is one of the largest cosmopolitan cities in the country that offers wide variety of local street foods and traditional dishes, as well as the international cuisines. The capital of Maharashtra, Mumbai is filled with several thousand's of restaurants including Global Fusion China Gate Restaurant, Masala Library, Shree Thaker Bhojanalay, Delhi Darbar, and Bademiya Kebab Restaurant. The local transportation in Mumbai boasts one of the largest public transportation networks in the country. It is well connected with various modes including local trains, buses, taxis, and auto rickshaws. Taxi and cab services are available 24/7 at any corner of the street. Chhatrapati Shivaji International Airport is one of the busiest airports in India in terms of international arrivals. It is the main hub for Air India, Air India Regional, Blue Dart Aviation, GoAir and Jet Airways. Being located in the western suburbs of the city at Andheri east, Mumbai airport handles more than 45 million visitors every year. Terminal 1: This terminal is used for domestic arrivals and departures. It is well equipped with 11 passenger boarding bridges. Terminal 2: This terminal is also known as international terminal. The new terminal offers plenty of options like 14 baggage carousels, 76 immigration counters, smoking zone, restaurants, shower area, spa and relaxation area. Mumbai is well connected with all means of public transport to reach the Chhatrapati Shivaji International Airport. It is easy and reliable to travel to and from the Mumbai airport by taxi, bus, car and auto rickshaws. Taxis are available 24/7 service and provide fixed prices with no hidden fees.